Henry McCoy joins the Marvel MMO and brings Jubilee along for the ride! Hank McCoy, resident X-Man big brain and bouncing blue ball of fists and feet, brings his brilliance to “Marvel Heroes 2016.” We talked to Gazillion Lead Game Designer Benjamin Gilbert about Beast’s abilities and another little treat: Jubilation Lee makes an appearance as the game’s newest Team-Up! We’ve got a lot to cover gang so let’s get into it! 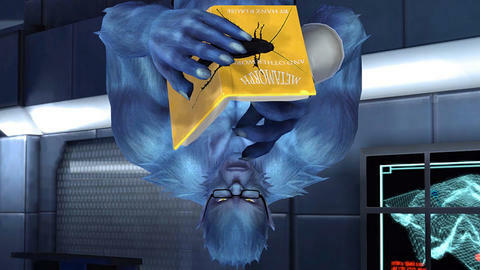 Marvel.com: I gotta ask, out of all the mutants with bigger, more bombastic abilities, what is it about the blue-furred Beast that brought him to “Marvel Heroes 2016”? Benjamin Gilbert: Being one of the original X-Men, he’s someone fans have been asking after for years now. We’re very happy with how he came out, and we hope players will agree Dr. McCoy’s playstyle is a nice mix of visceral and cerebral, which we think feels true to the character. Marvel.com: Ok what can you tell us about Dr. Hank McCoy? What do his ability trees look like? Benjamin Gilbert: There are two categories of powers: Brains and Brawn. Brawn features all the “Beast” stuff you’d expect: dashing, jumping, and slashing baddies chock-full of his flashy movements. These are the powers that make use of his custom resource: “Momentum.” Brains makes use of applied Science in the form of useful, mostly non-lethal gadgets. Then of course his Talents come, custom-tailoring Beast’s playstyle. Marvel.com: What’s the best way to play this guy? It sounds like he can be played like a melee brawler or maybe someone who lets his inventions speak, and fight, for themselves. Benjamin Gilbert: You can focus on acrobatic brawling, deployment of gadgets, or even “Teamwork” powers—unlock in Talents—which feature him coordinating with his fellow X-Men. Players have many choices with how they play Beast. Marvel.com: And what kind of costumes are we looking at here? Beast’s sporting his current comics style? What else do you have in store for the real McCoy? Benjamin Gilbert: Hank launched with two costumes. His default, Uncanny Inhumans, is in the current comic style. The other is Astonishing X-Men, which features a more “bestial” look. Marvel.com: And Beast isn’t the only X-Man showing up this week; Jubilee blasts on the scene fireworks blazing. What kind of help can we look forward to enlisting her aid? Benjamin Gilbert: She brings her signature smorgasbord of spontaneously created plasmoid fireworks to the fray! And all those pretty lights aren’t just for show—though quite spectacular—they’re in such high density that they burn clean through any obstacle. She’s a great helping hand for any Hero, especially those looking for a healthy dose of 90’s nostalgia. Marvel.com: Now that the game’s hit 60 playable characters, what’s next? More characters? Big events? What can we expect from “Marvel Heroes 2016” in 2017? Benjamin Gilbert: Yes! As for Heroes, Black Bolt and Medusa are up next, followed by the illustrious Nick Fury. Of course, we’ll regularly be rolling out events, both classic events like Odin’s Bounty and special ones like our Valentine’s Day event. Stay tuned to Marvel.com for more “Marvel Heroes 2016” news and interviews!